Immediately following Christmas I asked Clayton what theme he wanted for his birthday party this year. He didn't even have to think about it. 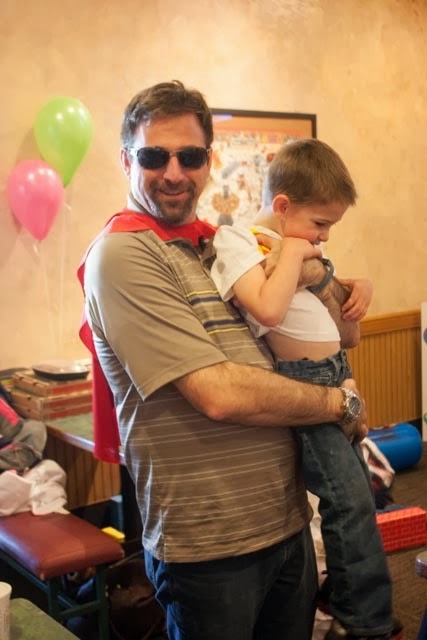 A superhero party! Clayton is our January 20th baby so party planning comes with some unique winter challenges...usually. Who knew January 18th, 2014 would be 75 degrees and sunny on his birthday? Oh well, we planned indoors anyways. We didn't want to host his party at home this year; it really is too small for a crowd of energetic preschoolers. This would be the first party where Clayton would invite his friends from school and he was so excited to have a few classmates there. We weighed our options and decided Round Table Pizza (the Forest Ave location in Chico) would be the perfect choice. 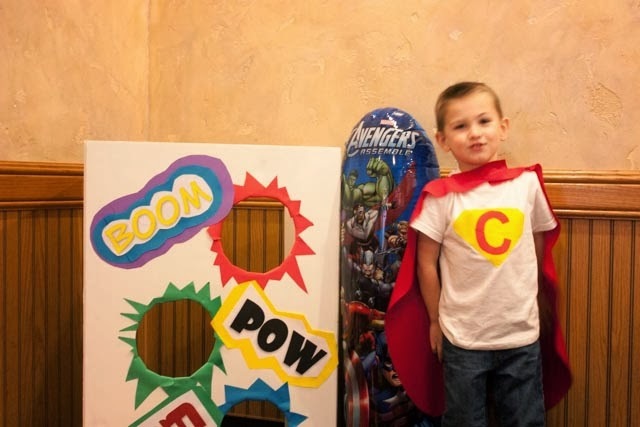 I knew I would need a few activities to entertain Clayton's guests so I used my crafting skills and made a homemade bean bag toss with some Superhero accents. 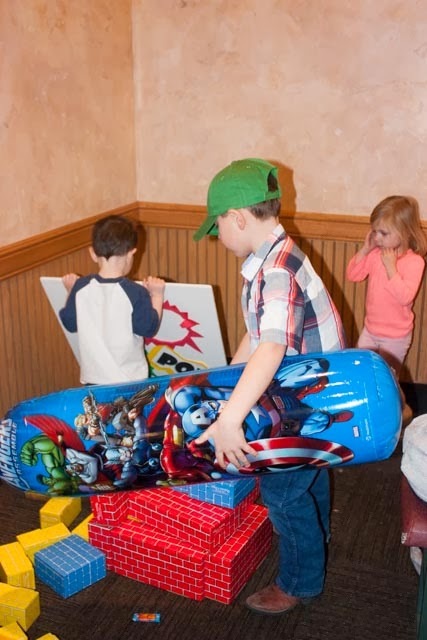 The kids table was wrapped in paper and accessorized with lots of crayons for the artistic guests and a large pile of cardboard blocks allowed the builders to create walls and knock them down like Superheros do. A cupcake cake made serving really easy. You might notice the cake has a blemish on the bottom left hand corner. 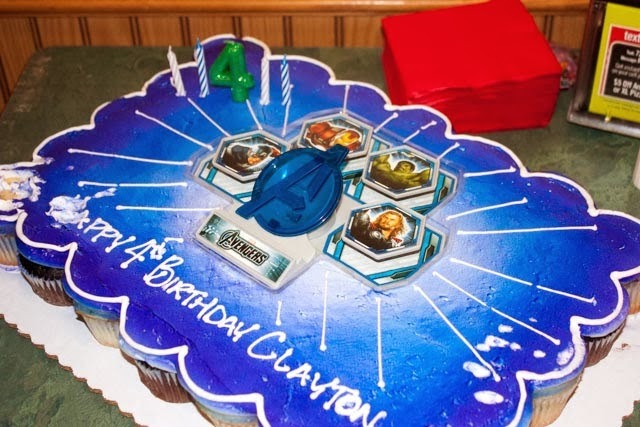 Clayton's little brother Dalton needed to taste the cake before the party started. He approved of the sweet blue frosting. 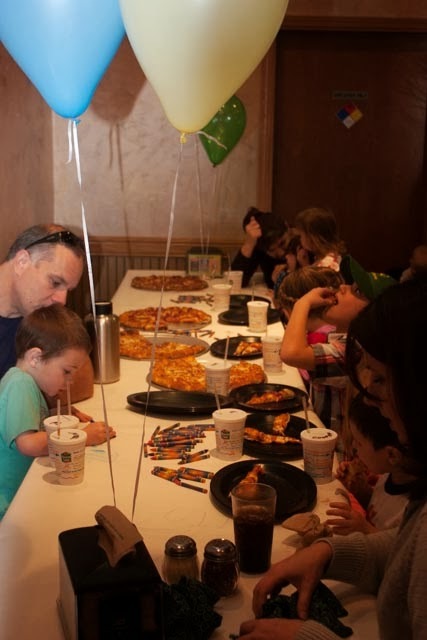 I choose Round Table Pizza because of the space they offered for the party however what I also got was a great menu option just for kids. Pizza, cinnamon twists and kid size drinks for a special price. Who doesn't like pizza? Superhero's need capes and masks too so I spent come quality time this last week making everyone a red cape and colorful mask to take home. As you can see below, Lorene Gore was happy to wear her's during lunch. 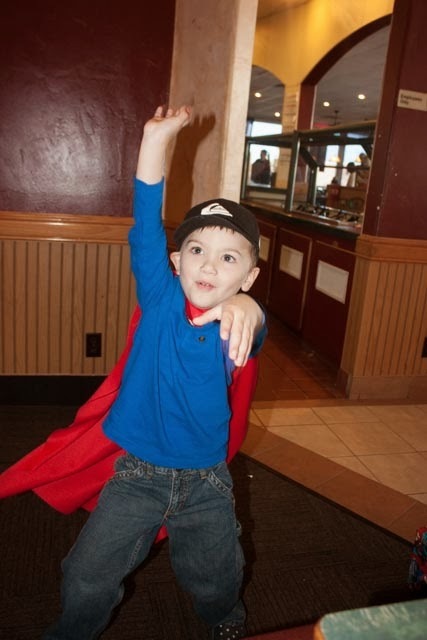 Our nephew Trevor displayed some Superhero moves with his cape on. all he is a super uncle. However no mask for him. The glasses were stealth enough. All in all it was a whirlwind 90 minutes and Clayton loved every second and that was all that mattered. A special shout out to Round Table Pizza manager James and his staff at the Forest Avenue location. Thanks for your awesome customer service, great pizza and for letting me move furniture and create a Superhero play ground. We will be back for sure! 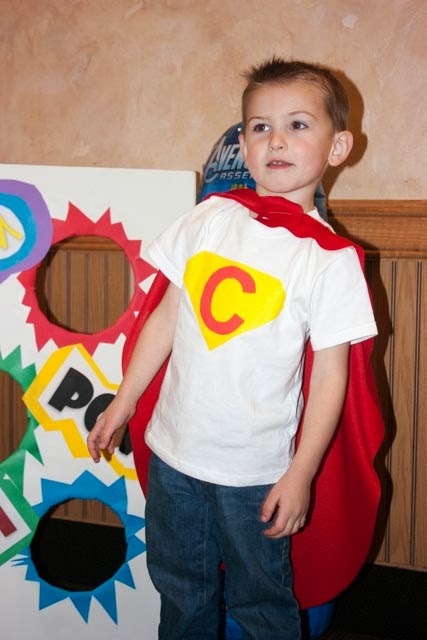 Happy 4th Birthday Clayton Jacob! 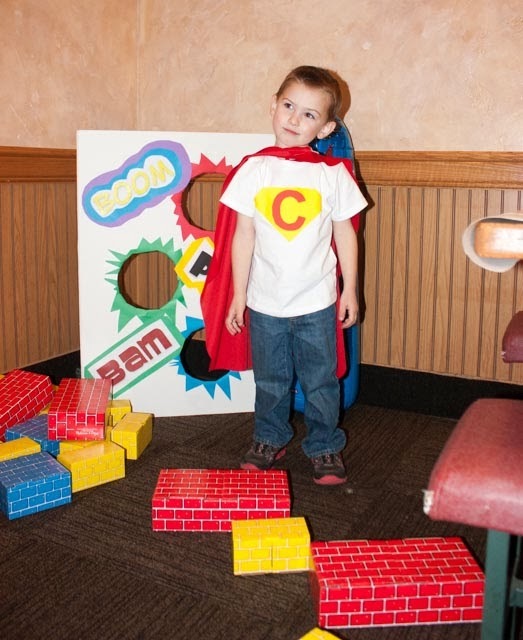 We look forward to watching grow into a SuperKid! Very cute party! 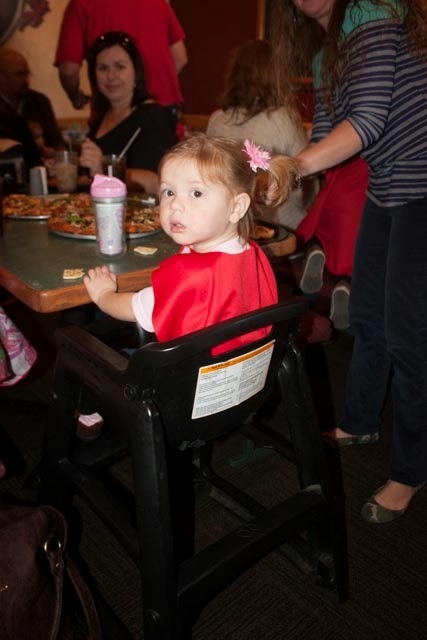 Your game looks fun and those capes are the perfect touch!